The Nissan R35 GT-R is a technological marvel. Its state of the art Twin-Turbo V6 engine coupled with its all wheel drive makes it one of the most advanced cars on the road today. Even though the GT-R is extremely powerful from the factory, some drivers still crave more speed, that's why HKS developed the GT600 Package. With two turbochargers, it isn't long before the factory GT-R fuel system is overwhelmed, and without adequate fuel supply an engine simply won't perform well, regardless of its other upgrades. Ensure that your GT-R, and your other engines upgrades are reaching their full potential with this HKS fuel system. HKS has found a 30hp upgrade when installing this package on a GT570 equipped car. 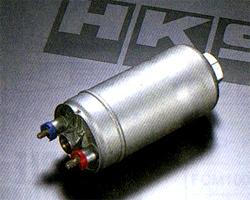 Note that if you want a true full upgrade to the GT600 kit you should also upgrade to the HKS Premium Suction kit.